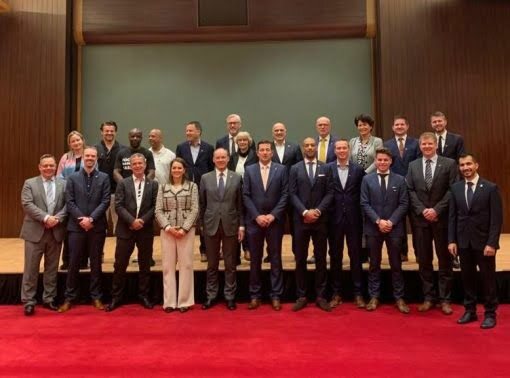 Orange Sports Forum organized a trade mission to Qatar in cooperation with the Ministry of Foreign Affairs and the Dutch Embassy in Doha, with 17 sport-related companies and organizations. The successful mission took place from 25 to 28 March and was led by Mr. André Driessen (Director International Enterprises, Ministry of Foreign Affairs). On the first day of the trade mission in Qatar, the embassy organized a B2B event with a pitch session at the Aspire Zone Hotel. Every Dutch company was given the opportunity to pitch and introduce themselves for the ± 75 present guests of various sports related parties from Qatar (f.e. Aspire Zone, Qatar Football Association, Qatar SportsTech, Qatar Sports Investments, etc.). In addition, Wesley Sneijder was also present to support the Dutch companies and learn more about the participating organizations. The meeting ended with a network lunch, this offered the companies an excellent opportunity to provide a further introduction and to follow up some contacts. In the afternoon the “Khalifa Stadium” was visited, the first of the eight World Cup stadiums that has been fully completed. This included a tour through the stadium and this gave a good impression of the ambitions of Qatar. The afternoon ended with an interesting visit to the “Museum of Islamic Art” in Doha. On Monday evening a network reception took place at the residence of the Dutch Ambassador, H.E. Mrs. Bahia Tahzib-Lie. During this reception the delegation met Dutch expats and relevant sports stakeholders in Qatar. An excellent way to expand the network in Qatar. During the network reception, the delegation signed a multi-year cooperation between 15 Dutch companies and the Dutch Government (Ministry of Foreign Affairs and the Dutch Embassy in Doha). The cooperation was signed by Mr. André Driessen (Director International Enterprises, Ministry of Foreign Affairs) and Mr. Camil Smeulders (OSF). With this cooperation, we aim to build long-lasting relationships in Qatar and want to position the consortium into the sports market in Qatar, to create fruitful cooperation’s in the field of sport, innovation and vitality. On the second day, the delegation visited the Supreme Committee for Delivery & Legacy. They are responsible for the stadiums, infrastructure and legacy of the FIFA World Cup 2022 in Qatar. Very impressive plans and infrastructure work were presented. These plans are implemented throughout the area in and around Doha. Their focus is on sustainability and the reuse of stadiums. Qatar also wants to become a leading sports nation, both on stage and beyond. In addition, Qatar is creating fan zones for the FIFA World Cup. During the visit various tenders were presented and explained how Dutch companies can participate in a tender. The delegation was then received at Qatar University. Thanks to the previous contacts during the pitch sessions on Monday, the delegation immediately had the opportunity to follow up several points of interest with Qatar University. They were well prepared and very interested in various Dutch companies and organizations. Furthermore, a meeting with the Qatar Financial Centre was scheduled. Qatar Financial Centre supports foreign companies to set up a business in Qatar and also with doing business in Qatar. They are basically a “one-stop-shop” for foreign companies. Sport is one of the main focus areas of QFC and therefore it was a very useful meeting to eventually be able to do business in Qatar. On day 3, the delegation visited the impressive sports facilities at Aspire Zone. After the substantive meeting, a tour was scheduled. Thanks to beautiful and excellent facilities such as covered stadiums, programs for young athletes with accommodation options, research facilities, education, etc., top-level sports facilities have been created. The consortium then visited Doha Festival City, the yet to be opened Angry Birds Park and Virtuocity. An impressive eSports Arena has been created in Doha Festival City, including a stage, a grandstand where all kinds of games can be played and large LED screens where the fans can watch the eSports competitions. 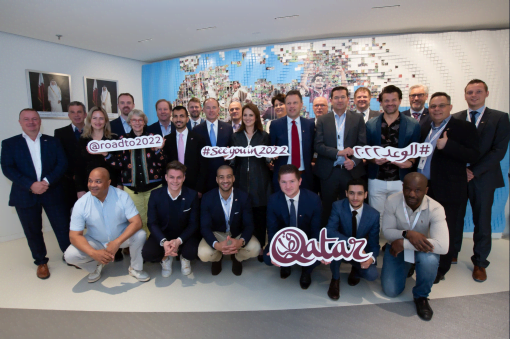 The Qatar Development Bank was visited on the last day of the official program, they are working on a Sport Accelerator in Qatar, where start-ups receive funding and are also offered a program to further develop themselves as a start-up. Then there was a meeting with Qatar Chamber of Commerce. 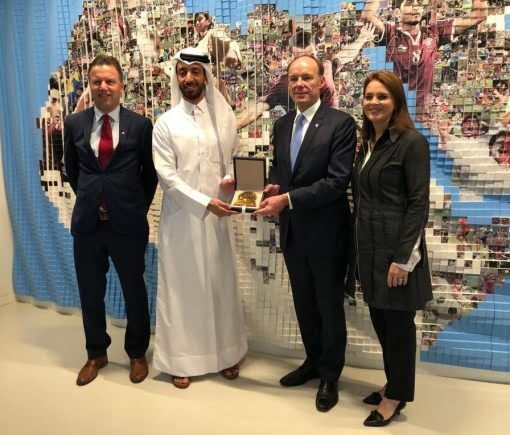 The meeting was led by the Dutch ambassador in Doha and the companies were given the opportunity to pitch their company briefly to the various guests and representatives from the Qatar Chamber of Commerce. After the presentations, there was a network lunch to discuss everything in more detail with the relevant organizations. In short, it was a very interesting and fruitful week. There appears to be a lot of interest in Dutch products, services and knowledge related to sports and vitality and there are plenty of opportunities to successfully follow-up this mission during the multi-year cooperation. See for more information about the participating companies the mission booklet: https://issuu.com/orangesportsforum/docs/missieboek_mrt2019_digitaal.